Endodontics is the dental specialty that deals with tissues and structures located inside the tooth. One of the most common endodontic treatments is root canal therapy, a procedure which effectively eases the pain associated with a bacterial infection deep within the pulp of the tooth. Of course, root canal treatment doesn’t just relieve pain — it also stops the infection by removing dead and dying tissue from the tooth’s pulp. Plus, it helps to save the tooth, which is in danger of being lost if left untreated. Yet root canal therapy isn’t the only treatment endodontics offers. This field also deals with cases of dental trauma, performs microsurgery on the tips of the tooth’s roots, and even helps figure out what’s going on when tooth pain seems to come and go intermittently, or when the pain isn’t localized at one tooth. So when it comes to preserving your natural teeth, endodontics has plenty of ways to help. Healthy Tooth.What’s inside your teeth? 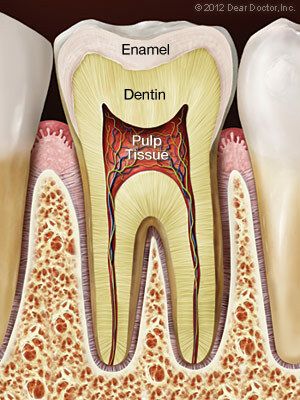 Behind the tough, shiny enamel of the tooth’s visible crown lies the sturdy inner tissue called dentin. Dentin is also found behind the cementum that forms the outer layer of the tooth’s roots — in fact, it makes up the bulk of the tooth’s structure. Similar in many ways to bone tissue, dentin is composed of many tiny tubules which can transmit sensations to nerve cells when it is stimulated. 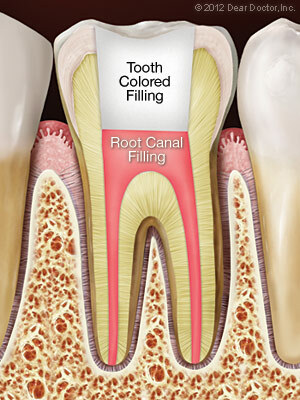 At the core of the tooth, inside small, branching chambers called the root canals, we find the soft pulp tissue. 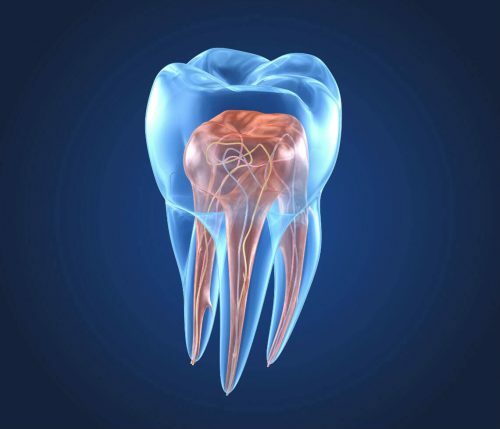 This consists of nerves, connective tissues and blood vessels which extend into the center of the tooth and exit through canals near the apex (tip) of the tooth’s roots. When problems (such as infection and inflammation) develop in the pulp tissue, your first indication of trouble may be tooth sensitivity — or intense pain. In time, as the nerves die, the pain may go away… but the problem won’t. In fact, if left untreated, the end result may be tooth loss. 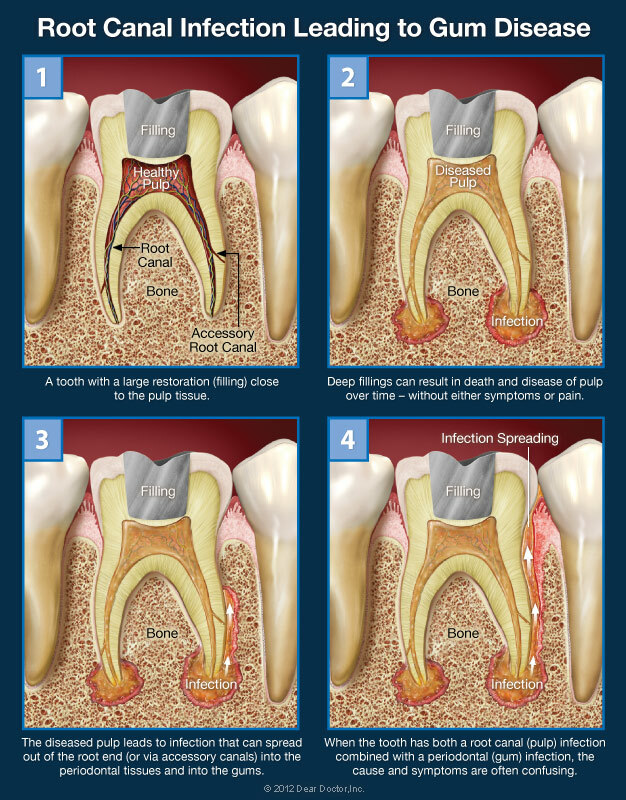 Root canal treatment.What could cause the pulp tissue to become diseased and lead to root canal problems? One potential source of infection is untreated tooth decay, which can allow bacteria from the tooth’s surface to work its way deep inside. 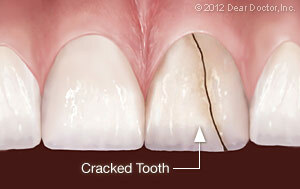 A crack or fracture in a tooth could offer another pathway for microorganisms to infect the pulp. When you experience pain in your mouth, it’s sometimes abundantly clear which tooth is causing it. At other times, the sensation of discomfort is more diffuse, generalized or hard to pinpoint. 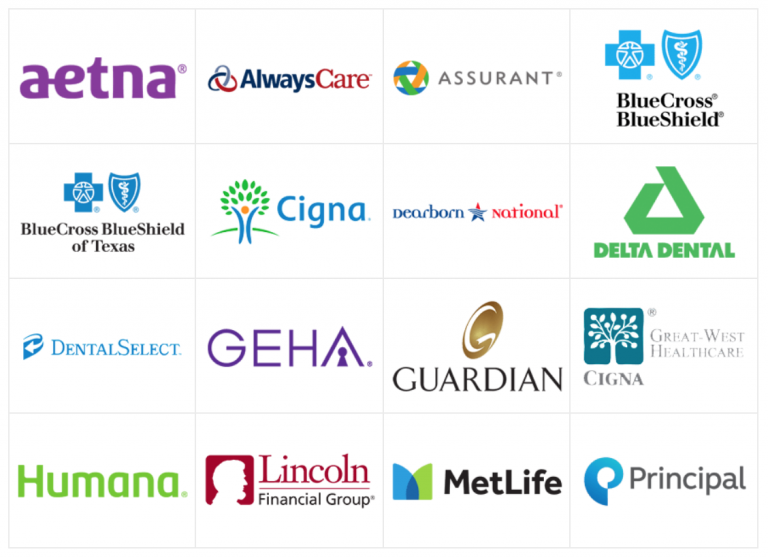 On occasion, it can even be challenging to determine exactly what problem or combination of problems is causing the symptoms you’re experiencing. 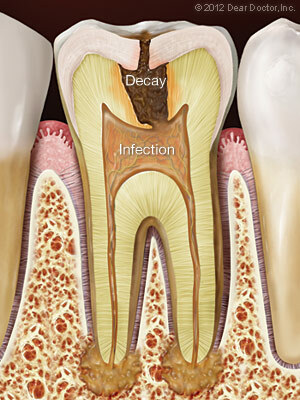 This may be the case when an infection exists in the root canals of a tooth as well as the gum tissue adjacent to it. 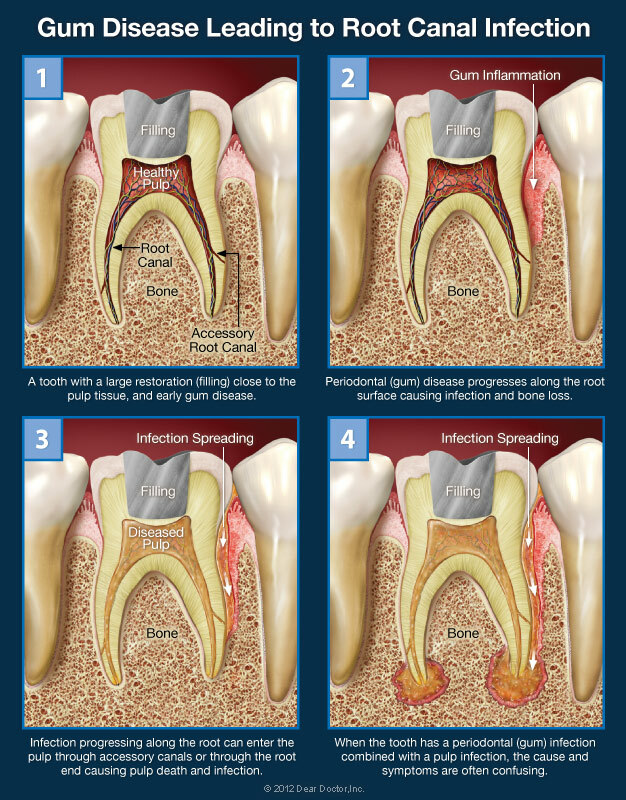 In this situation, the infection may have begun in the pulp of the tooth itself; or, it may have started in the gums. Over time, it has spread from one location to the other — and now it’s causing a confusing set of symptoms that are difficult to sort out. Regardless of where the problem started, a thorough analysis will be necessary before treatment can begin, to give you the best chance of saving the tooth. From time to time, many people experience oral discomfort that’s dull or intermittent. Occasionally, a more insistent pain may be triggered by a stimulus like temperature (from hot or cold foods or beverages) or pressure (from biting down on something). Sometimes, it may feel as though the ache is coming from a group of teeth rather than one single tooth — or even from the sinus area above the back teeth. These symptoms can indicate a number of dental issues, including root canal and gum problems, and shouldn’t be disregarded. However, if you manage to ignore the acute pain, in many cases it will fade in time. But this isn’t good news: It generally means that the infected tissue in the pulp of your tooth has died, and the nerve is no longer functioning. That’s when the problem may become more serious. 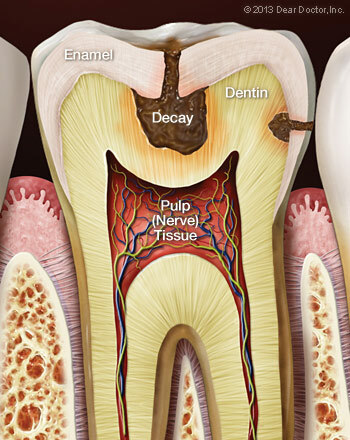 When the pulp tissue inside your tooth becomes severely infected, it’s possible for the disease to move through openings at the end (apex) of the root, and outside of the tooth. It can then spread to the periodontal ligament, which anchors the tooth to the surrounding bone and gum tissue. From there, the infection may extend to the gum tissue and cause periodontal disease, or even result in a painful gum abscess. 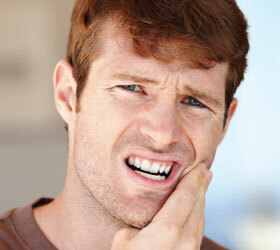 At that point, you may have pain — even severe pain that will let you know exactly which tooth is affected. But it’s also possible for the infection to be spread by the exact opposite pathway. In this case, an infection that originated in the gums (commonly due to periodontal disease caused by a buildup of plaque) may have has traveled through small passageways called accessory canals, which are located in between a tooth’s roots, or on the sides of the roots. The infection can then extend into the tooth’s pulp. If your teeth are fractured, it’s even easier for disease to spread. When dental problems involves both root canals and gum disease, saving the affected tooth can prove challenging. This is when it matters where the infection started: If it’s primarily a root-canal problem that later moved into the gums, the outlook for the tooth is reasonably positive if it receives immediate treatment. If gum disease came first, however, the prospects often aren’t as good; by the time the infection has moved into the tooth, it’s possible that much bone has already been lost, making the tooth’s long-term prognosis poor. In either case, the cause of the tooth pain will need to be diagnosed and an effective treatment plan developed. The sooner that happens, the better: Root canal and gum problems simply don’t get better on their own. Most of the time, root canal therapy is effective at permanently relieving tooth pain and halting infection of the soft tissues deep inside the teeth and gums. But occasionally, as in any medical procedure, the body may not heal as we expect it to. After a period of time, you may experience pain in the affected tooth again — or, even if you have no symptoms, x-rays may reveal that infection is still present near the tooth’s roots. In that case, you may need root canal retreatment. There are several reasons why your root canal treatment may not have succeeded at first. The “canals” themselves are slender, forking passageways deep inside the tooth that enclose nerves and blood vessels: the tooth’s soft “pulp.” They can be so narrow and intricate that some may have gone undetected, or failed to respond to treatment the first time. Or, the canals might have become recontaminated via a number of routes: a delayed or ineffective crown restoration, new tooth decay, advancing gum disease, or a cracked or fractured tooth. Any of these conditions could result in reinfection. If initial root canal (endodontic) therapy has failed, the first thing to do is evaluate your options. Besides retreatment, the alternatives may include endodontic surgery or extraction (removal) of the tooth. However, a missing tooth should be replaced by a dental implant, a bridge or a partial denture as soon as possible — and none of these are simple or inexpensive options. That’s part of the reason we prefer to help you retain your natural teeth whenever possible. Medicine and dentistry are as much art as science, and neither one can guarantee that any procedure will be 100% successful. 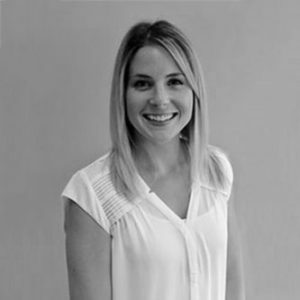 While endodontic retreatment can be more complex than initial root canal therapy, it offers a good chance of success in many instances. 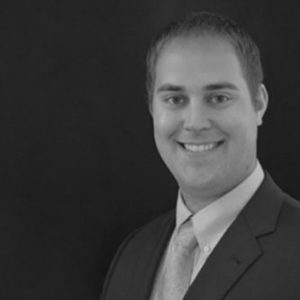 And, since the field of endodontics is constantly evolving, it may be possible to use new techniques that weren’t available when your first root canal procedure was done. Dentists take seriously our responsibility to help you understand the risks, benefits and alternatives for treating root canal problems. 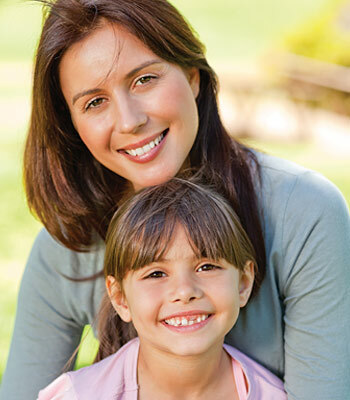 When we recommend retreatment, it’s because we feel it is the best way for you to preserve your natural teeth — and we want you to be able to enjoy them for many years to come. Root canal treatment — also called endodontics (“endo” – inside, “dont” – tooth) — is a set of specialized procedures designed to treat problems of the soft pulp (nerve) tissue inside the tooth. While some mistakenly think of it as an unusually painful treatment, in most cases the procedure is no more uncomfortable than getting a filling. It’s actually one of the most effective ways of relieving some kinds of tooth pain. If you have been told you need root canal treatment, you may be feeling a bit nervous. Not to worry — treating root canal problems is a routine part of dentistry that can relieve certain kinds of tooth pain and help your teeth last longer. 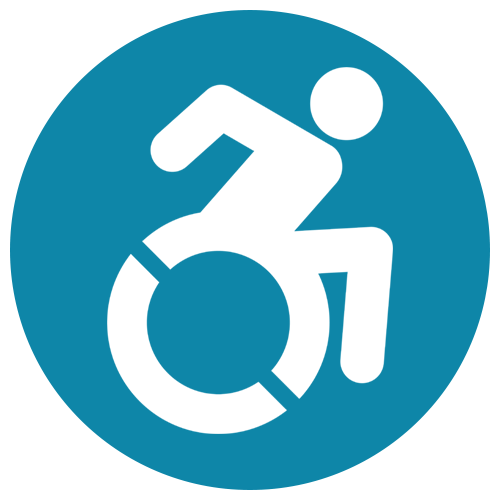 As you learn more about this beneficial procedure, you will understand why it’s needed — and how it will leave you in far better shape than you were. Here are some answers to frequently asked questions. If tooth pulp becomes acutely inflamed or infected because of decay or injury, the tissue will need to be removed in order to save the tooth and stop the infection from spreading. 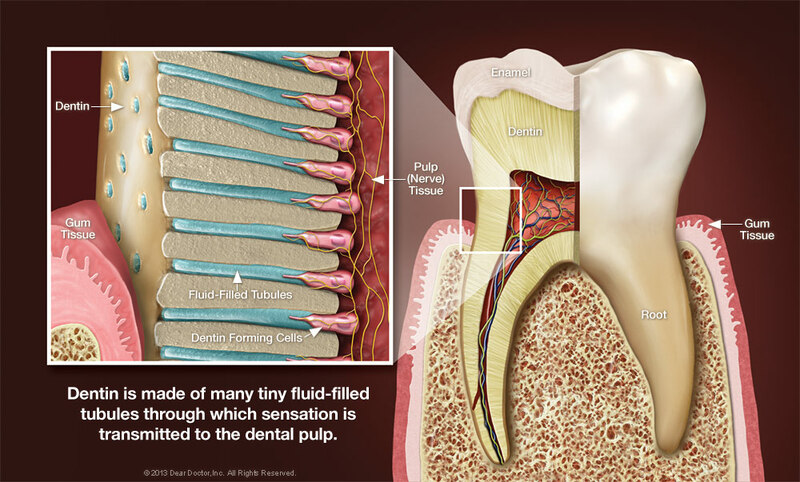 As an adult, you don’t actually need the pulp — its primary use is to aid in tooth development during childhood. You could have the whole tooth extracted, but it’s always better to try to save it — especially since root canal treatment is routine and has a very high success rate (over 90%). Saving the tooth can prevent other troubles from occurring later on; these could include bite problems from teeth shifting position, difficulty eating, and loss of jawbone volume and density. The procedure normally causes no more discomfort that a filling would. Root canal treatment may have a bad reputation, but it is undeserved; in this case it’s the disease that’s to blame and not the cure. In other words, the infections that make the treatment necessary in the first place are often painful because they are inflaming tissue that has lots of nerves and therefore is very sensitive. Root canal treatment actually relieves this pain! 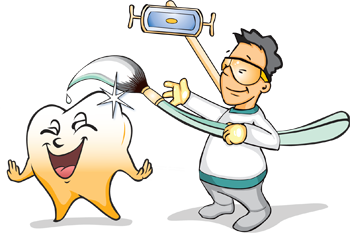 Keep your teeth decay-free by brushing and flossing every day. Eat a healthy diet low in sugar and avoid acidic beverages such as soda. Have regular professional cleanings and exams. And if you’re active in sports, consider ordering a custom-made mouthguard to protect your teeth from injury. What can you do about sensitive teeth? If it’s a relatively minor irritation, try not to brush the affected teeth too long or hard. Make sure you’re using a soft-bristled brush and the proper, gentle brushing technique. Always use a toothpaste containing fluoride, as this ingredient is proven to increase the strength of tooth enamel, which helps resist erosion. You can also try a toothpaste with ingredients designed especially for sensitive teeth, such as potassium. Studies show that these can be effective… but it may take approximately 4 – 6 weeks for you to notice the difference. Teeth whitening is one of the most popular cosmetic dental treatments — and it’s easy to see why. Having whiter teeth can make you look years younger, and the procedure itself is among the most conservative (and cost-effective) cosmetic treatments dentistry offers. Sometimes, however, achieving a pleasing, even shade of lightness can be challenging; this is particularly true when a tooth that needs to be lightened has been subjected to an injury (dental trauma) in the past. 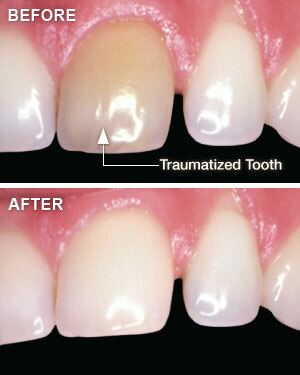 Dental trauma encompasses any damage to the tooth that’s caused by an external agent, whether accidental or intended. It may be due to a fall, a sports injury — or even a past orthodontic procedure. According to some studies, around a quarter of Americans aged 6 to 50 years old have experienced some traumatic dental injury, with most occurring before age 19. Traumatized teeth may react to whitening procedures differently from undamaged teeth, which can make them difficult to treat. However, several effective treatments are available. The first step in the process of lightening a traumatized tooth is a thorough exam to find out what’s causing the dark staining — and one of the first things we will determine is whether or not the tooth’s pulp is “vital,” or alive. This is readily revealed by radiographs (x-rays) or other tests. If the tooth is still vital, external bleaching can often yield satisfactory results — even if it’s just one tooth that needs to be whitened. In-office treatments or take-home trays are effective, but office procedures generally take much less time to produce good results. In many cases, however, discoloration of a traumatized tooth is itself an indication that the nerves in the tooth’s pulp have died. In this case, before whitening treatment can start, a root canal procedure will be necessary to remove the dead or dying tissue and prevent infection. It can also happen that a tooth that appeared normal will begin to discolor many months (or years) after a root canal has been performed. In either situation, it may be possible to whiten a non-vital tooth with a procedure called internal bleaching. Access to the pulp chamber (the small passageway in the tooth’s center) will be gained by making a small hole in the back of the tooth. Then, any debris from the chamber will be removed and rinsed away, and a special cement will be added to prevent the bleaching agent from leaking into the tooth’s roots. When the tooth reaches the desired color change, a more permanent restoration will be placed on the tooth to seal that little hole — usually a tooth-colored filling material of composite resin. Many times, this relatively conservative procedure will give your tooth all the lightening it needs. 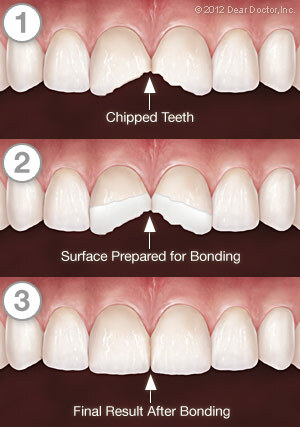 If it’s not enough, the tooth can be bleached externally as well, or you can even consider a veneer or crown. 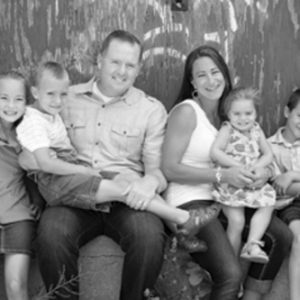 The goal is to recommend the most appropriate cosmetic dental procedure, and get you the best possible results.